– Irene und Johannes Hedinger sen. Become a member and Bloch Holder yourself! 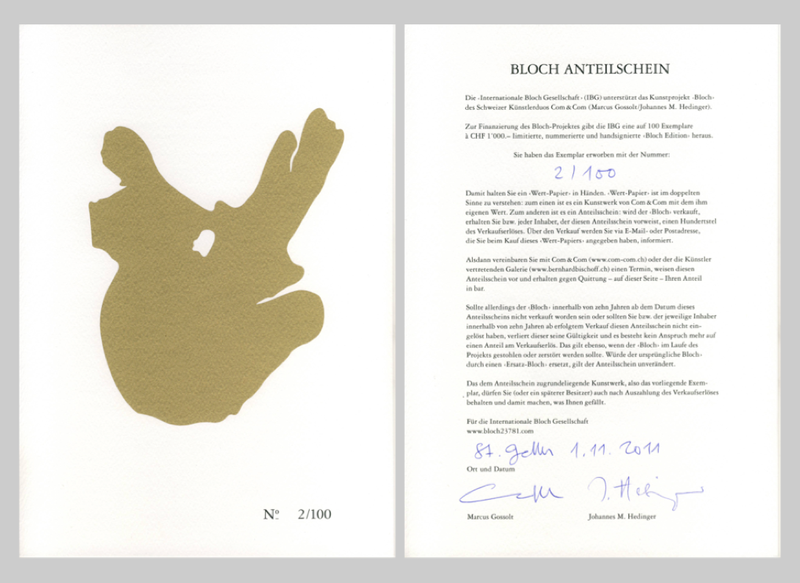 To support and finance the BLOCH project, the Internationale Bloch Gesellschaft (IBG) has issued 100 limited-edition BLOCH prints for CHF 1,000. Each print features a gold silkscreen of a BLOCH cross-section and is numbered and signed. The work is an investment in two ways: on the one hand, an artwork by Com&Com with its own intrinsic value; on the other, a share certificate: if the BLOCH is ever sold, the holder receives one percent of the proceeds. In any case, the owner can keep the print even after the shares are disbursed.